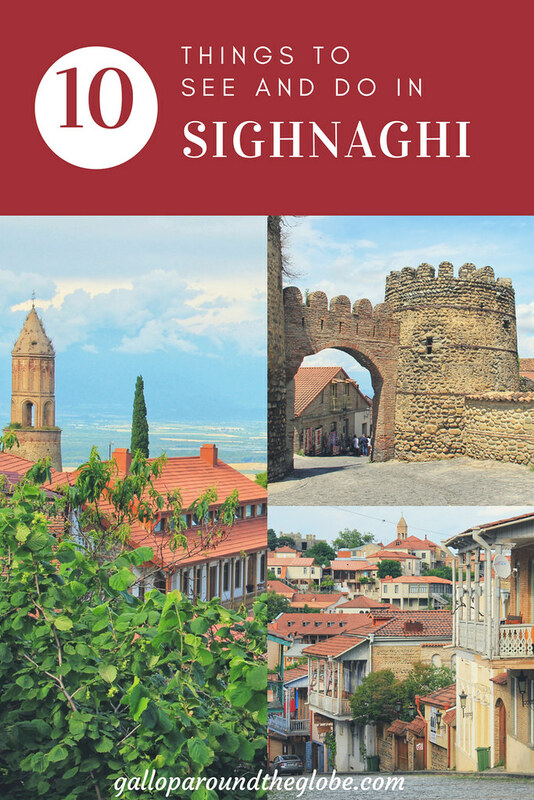 It didn’t take much more than a single photograph to convince me to add Sighnaghi to my 10-day Georgia itinerary. 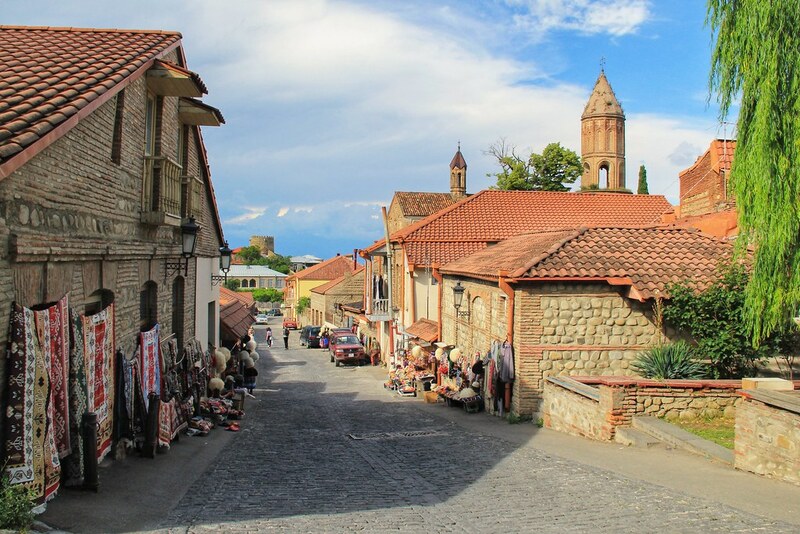 Sighnaghi sits on a hilltop 60 kilometres southeast of Telavi (the largest town in Kakheti) and 109 kilometres east of Tbilisi. Reminiscent of a charming little Italian village full of 18th and 19th century architecture and colourful wooden balconies, Signaghi is almost completely encircled by its well-preserved fortifications. It’s the kind of place where you can quite happily wander its cobbled streets for hours with no particular purpose or destination in mind (except, perhaps, the odd winery or two). 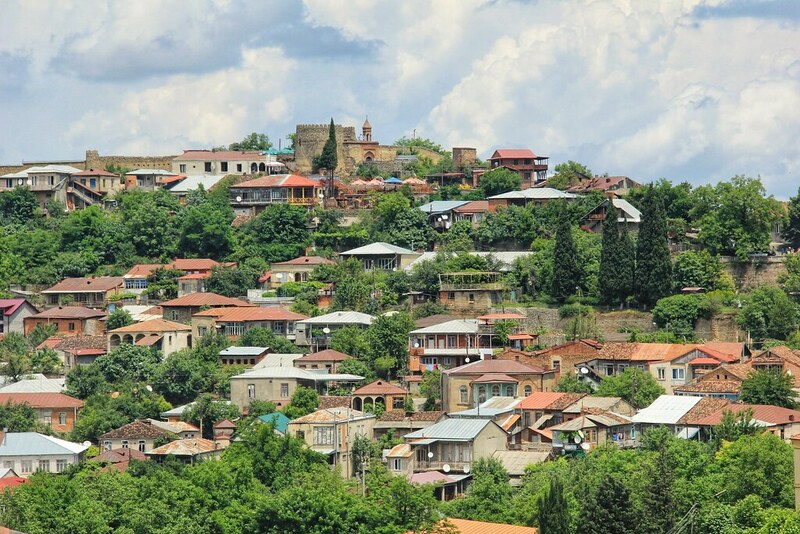 As well as being the heart of Georgia’s wine producing region, Sighnaghi is also known for it’s tagline: ‘The City of Love.’ Even our guest house was called “Honeymoon.” The reason? Well, there are two actually. The most famous one is that it’s possible to get married 24 hours a day in Sighnaghi, so many Georgians come here to wed their loved ones. The second is a legend that may or may not be true (although, being a cynic realist, I suspect it’s probably not). One of the most famous Georgian painters, Nikala Pirosmani was from Sighnaghi. Legend has it that he sold his house to buy a million roses for his lover, but she left him and he died a poor man. I’d say it was more a story of loss and financial stupidly rather than love, but they refer to it as a “sad love story” in Sighnagi’s National Museum – where you can see a collection of his paintings. 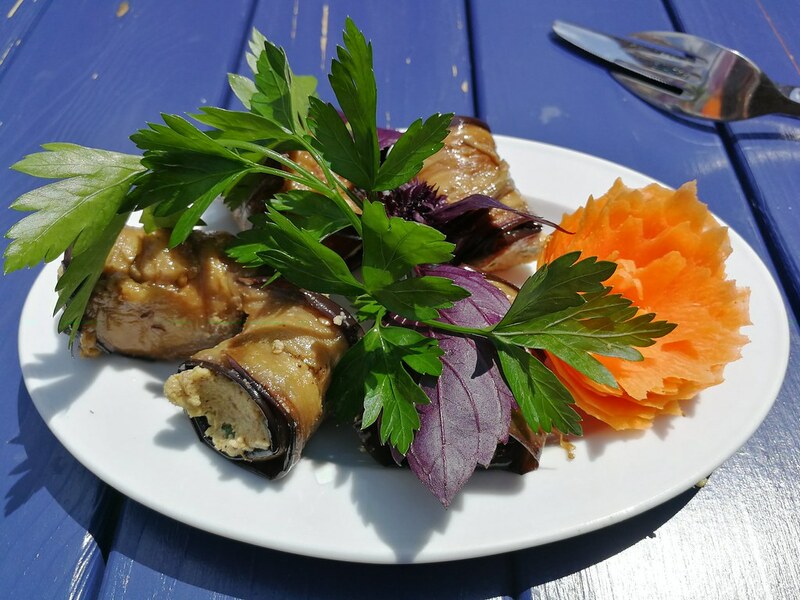 Here are a few more things you might like to see and do (and eat!) during your time in Sighnaghi. One of my favourite snacks/starters in Georgia, Nigvziani Badrijani are slices of fried aubergine served with a walnut and garlic paste. The nicest we tried (and, trust me, we tried a lot!) 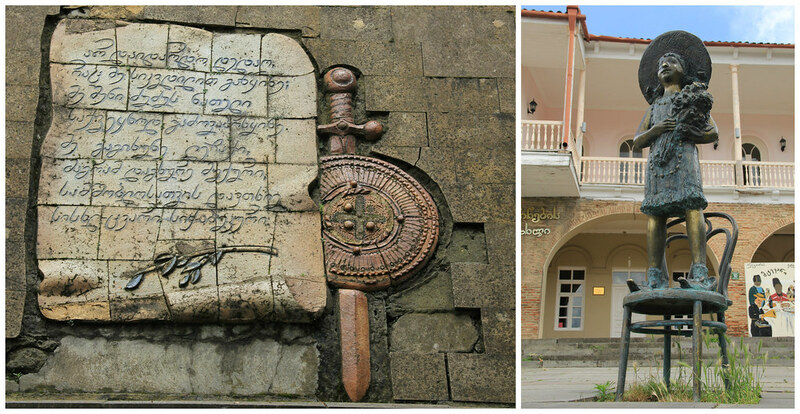 were at Mtevani – the restaurant next to the tourist information office in Sighnaghi. 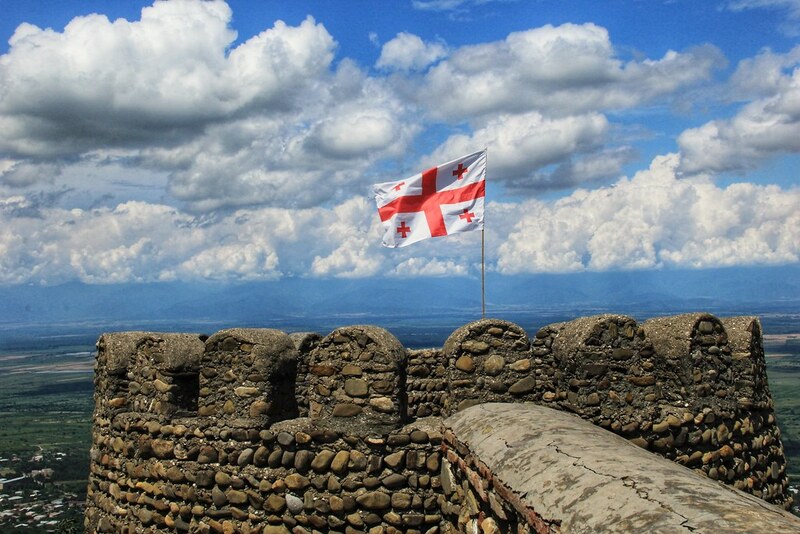 Sighnaghi’s city walls are five kilometres long and incorporate 23 towers. Although the fortifications do still almost completely encircle the town, you can only actually walk along a small section of the walls on the northern edge of town. 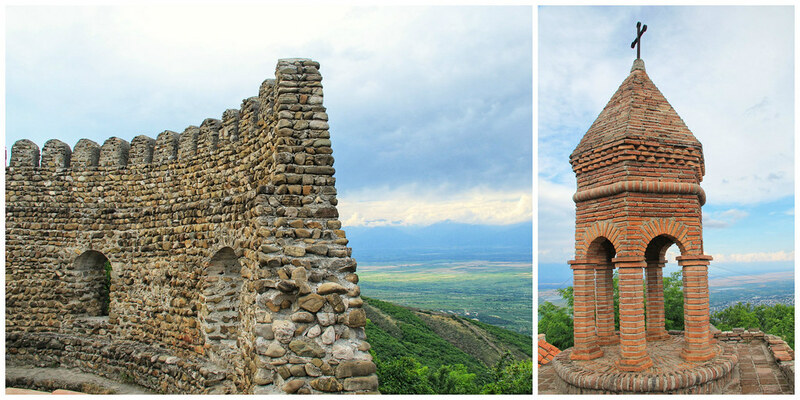 If you have a head for heights and good balance, you can even climb to the top of one of the towers for views of the vast Alazani Valley, with the Caucasus Mountains visible in the distance. Churchkhela is the Georgian snack you’ll see hanging up on street stalls throughout the country. It looks like some kind of cured sausage but is actually completely vegetarian, and is made from nuts (usually walnuts) coated in a mixture of grape juice and flour. I didn’t get around to trying any in Tbilisi so as soon as I saw them for sale at one of the open air markets in Sighnaghi, I bought a few. Even after eating several, I still wasn’t sure whether I liked them or not, but they certainly weren’t unpleasant (maybe a little odd) and they make a great, high energy, low-cost snack to take with you on long hikes and bus journeys. You’ll find these particular market stalls close to Davit Agmashenebeli Square. Leading down to possibly one of the loveliest streets in Sighnaghi, the town’s fortress gate forms part of the original fortifications that were constructed in 1762 by order of King Heraclius II of Georgia. I’m not sure how much of what you see here is actually part of the original structure and how much has been rebuilt, but nonetheless they’ve done a pretty good job of seamlessly blending the two. There are two Georgian Orthodox churches in town – one dedicated to St. Stephen, and this one dedicated to St. George. There’s a lovely shaded rose garden in the grounds of the St. George’s Church and some pretty good views of the old city walls from the top of the steps in front of the tower. 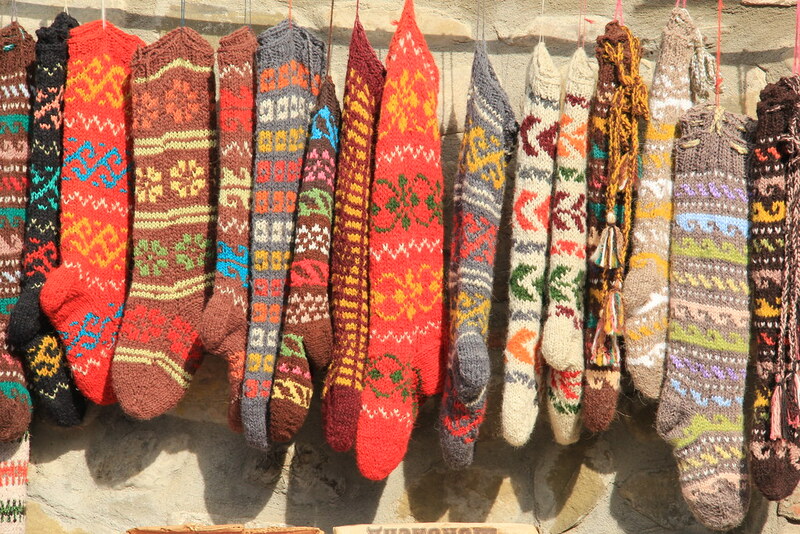 Even though it was the height of Summer when we visited and the temperatures were hovering around 30 degrees, Gorgasali was still lined with knitted socks, woven rugs, and fur hats for sale. This little restaurant (Nikala) struck the perfect balance between taste and value. 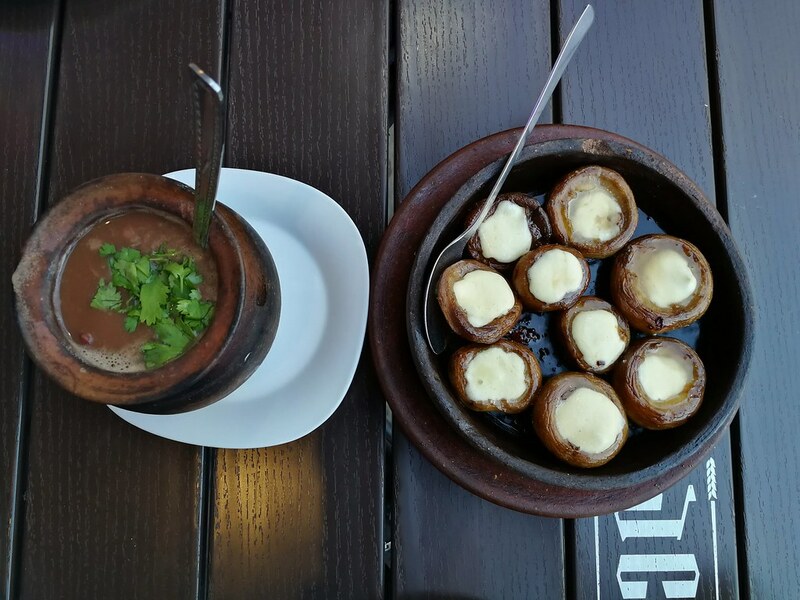 I ordered Lobio and baked mushrooms filled with sulguni (local) cheese. Lobio is a bean soup that’s cooked in a clay pot with herbs and spices and served with fresh coriander. Even my meat-eating boyfriend absolutely adored this wholly vegetarian dish, and it was one of my favourites (and reliably good everywhere) in Georgia. This church is a lot more difficult to find than the Church of St. George, and therefore a lot less frequented by tourists – many of whom only make it as far as the Okro Winery. In fact, I’ve just attempted to find it on Google Maps in order to geotag it in this post, but with no avail. You’ll need to download the map of Georgia on maps.me if you want to accurately locate this little gem. 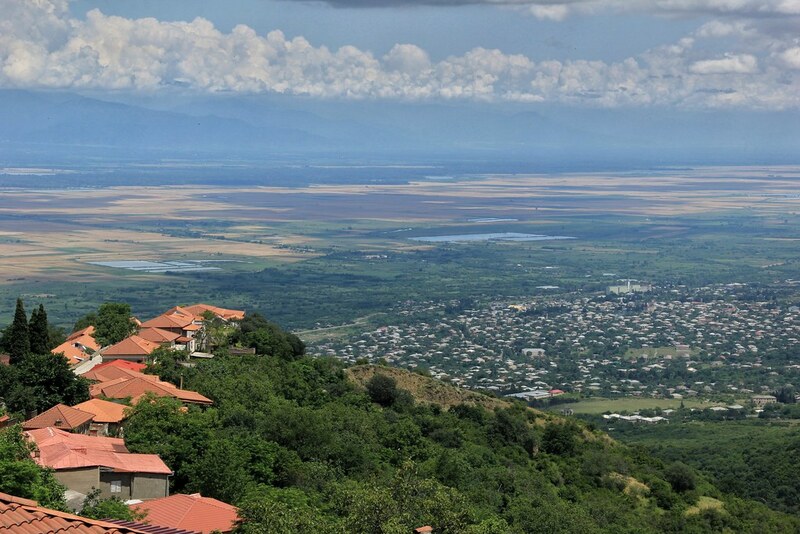 Alternatively, follow the signs to Okro Winery in Davit Agmashenebeli Square, but continue uphill, along the road the circles the edge of Sighnaghi. Keep your eyes right for a set of small steps that lead up to the church. There’s not much worth looking at inside but keep climbing; it the views you come for here. 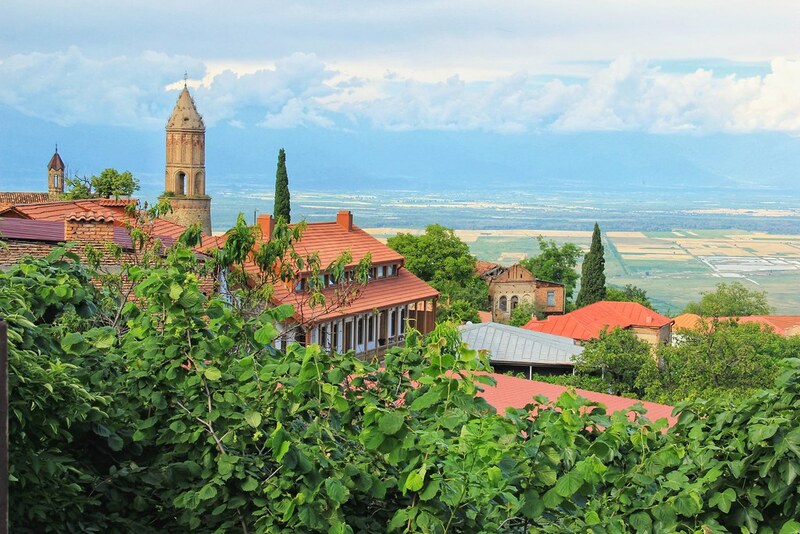 It would be criminal to visit the heart of Georgia’s wine region without tasting any wine. Before I started researching travel to Georgia, I didn’t realise Georgian wine (ghvino) was a thing. But Georgian wine is a BIG thing. Did you know that wine has been made here for 8000 years? Or that 500 of the world’s 2000 grape varieties are Georgian? 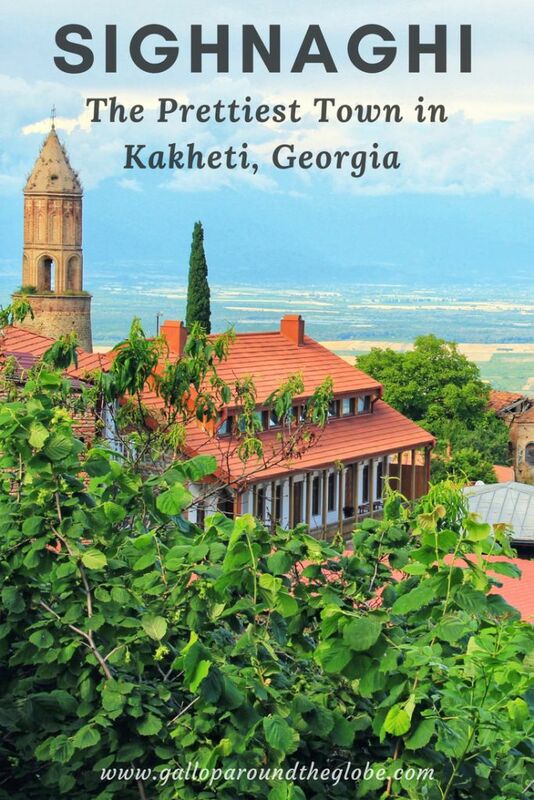 Georgia is particularly famous for qvevri wines – also called ‘unfiltered wine’ because it contains little or no additives, such as yeast, sugar or sulphur. 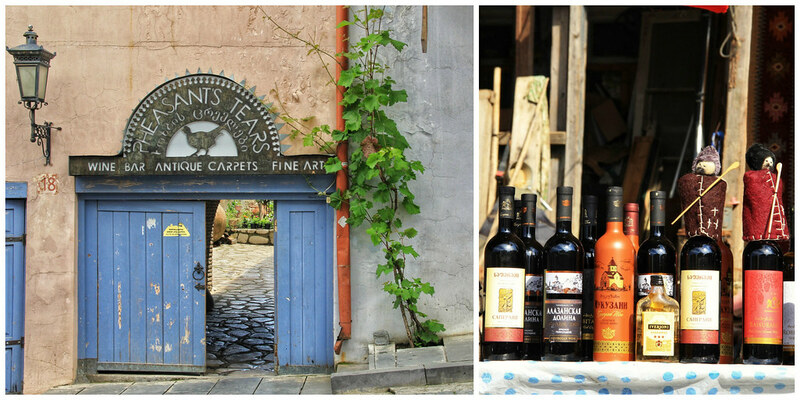 Pheasant’s Tears Winery is located not far from Erekle II Square, on Erekle Meore Street as it heads uphill. 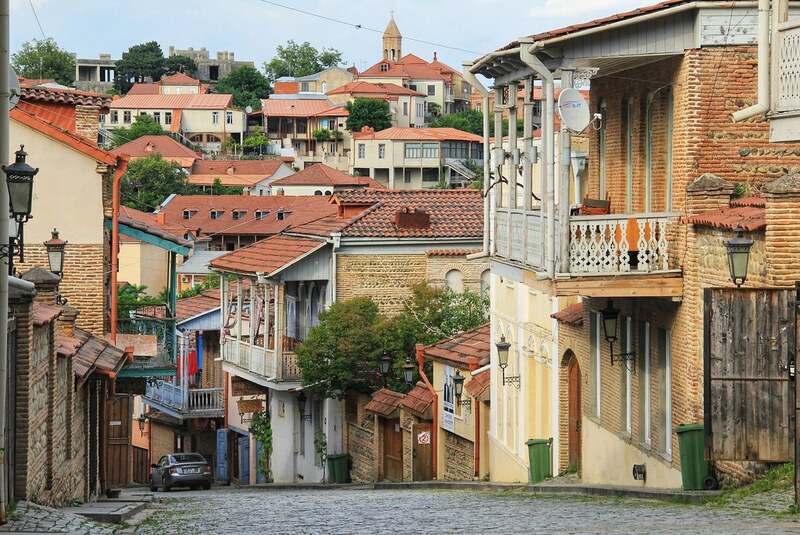 Whilst you’ll find these all over town, one of the prettiest streets for photographing Sighnaghi’s attractive wooden balconies was the one that led up to our guesthouse. Continue uphill from the Pheasant’s Tears Winery until you reach the statue of a lady and her dog (below). When you arrive here, turn around and you’ll be rewarded with this wonderful view. 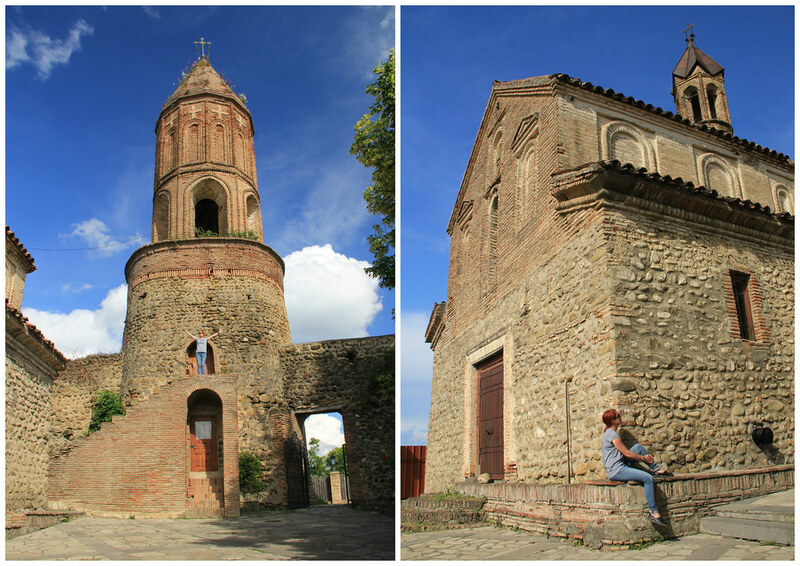 It’s possible to visit Signaghi on a day trip from Tbilisi. 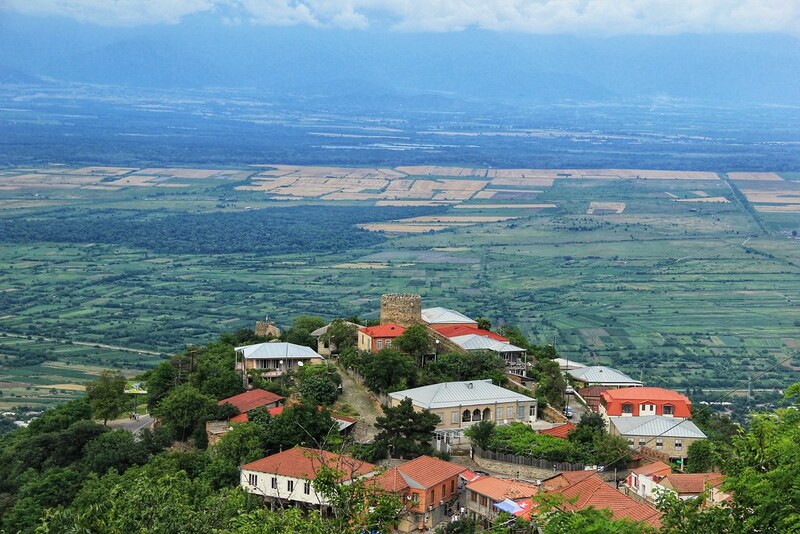 Companies such as Viator run full day tours to Signaghi (some of which also include Georgia’s old capital, Mtskheta and Bodbe Monastery). Alternatively you can make the two-hour journey each way by marshrutka (local minibus). Marshrutky run every couple of hours from 09:00-17:00 hours from the bus station just across the road from Samgori metro station. Just tell anyone at the bus station where you’re headed and they’ll point you in the right direction. Cost is 6 GEL. For the return journey the buses run every two hours from 07:00 hours from the bus station behind the police station. Because we didn’t want to rush our visit (and because we had time), we factored in an overnight stay. In the capital of Georgia’s wine region, we also wanted the opportunity to indulge in a little (we may have polished off an entire litre between us) of the stuff it’s famous for. Signaghi is pretty small (it only has a population of 2150 inhabitants), so wherever you stay you’ll be pretty well located for exploring the town. Booking.com is my go-to website for booking accommodation (primarily due to the free cancellation option, variety of choice available and cheap prices). If you’d like £15 off your next booking with them (regardless of whether you’ve used the site before), make your reservation via this link. We stayed at a guesthouse at the top of the road that leads down to Erekle II Square (the same road that takes you to Bobde Monastery in the opposite direction). It was a short but arduous climb in the heat, but afforded us some incredible views across town. When he checked us in he took the time to chat to us, to give us a map of the town and to point out areas of interest. He also invited us to contact him on WhatsApp, should we need anything at any time of day or night. We took him up on his offer when we needed to find out the times of the buses back to Tbilisi and the Tourist Information Office had closed over an hour early. He responded within 15 minutes with the information we’d asked for, along with a little map and photo of where to buy tickets and where to catch the bus from. Absolute legend! I cannot recommend our beautiful little guesthouse and amazing host enough. If you’re coming to town, see if you can snag a room at Guesthouse Honeymoon. We paid just 90 GEL (£27) for a double room with balcony. What you see pictured (above) is the family suite with balcony that we were upgraded to. What a fabulous town! I’d never heard of it. So much to see, eat, drink and photograph. I’d love to visit one day.